Before you start cruising Pinterest for inspiration or wind up at the tile shop in love with $20/sq ft flooring, these are my bathroom remodeling tips to consider in the early stages in hopes they’ll save you time and money. Decide what level of bathroom update you really need to be happy with your new space at the end of the day—or year. It’s easy to look for bathroom design ideas on hundreds of blogs and end up wanting an $80,000 bathroom on a $10,000 budget. If your tile and floors are livable, a bathroom suite (coordinating bathtub, lavatory, and toilet) with fresh faucets may be enough change. If you feel compelled to start moving walls or plumbing, you’re in for a bathroom remodel and many more dollars. Most people think that calling an architect or a designer will blow the budget, but in my experience the cost of consulting professionals not only makes up for itself in fewer mistakes, but it often results in a better bathroom remodel. For instance, a local concrete counter designer was able to create a custom counter for me for the same price as something I would have ordered at a big box store, and you won’t find another counter exactly like it anywhere. Also by consulting this counter designer, I found out that a heavy counter wasn’t going to work on my existing cabinetry. We had to work around it by making the counter thinner and adding supports to the cabinetry. I wouldn’t have known this until it was late in the process and potentially quite expensive to fix. So don’t be afraid to pick up the phone and start calling bathroom professionals to look at your project; you will likely be surprised. Even if you’re planning to do it yourself, have someone come consult to make sure you’ve considered all the mechanics before you bring out the sledgehammer. Back in the day when I first started remodeling my bathrooms, I started the budget with what I assumed would be the highest priced parts: tile and flooring. But if you look around and document everything you’ll need—15 cabinet knobs and drawer pulls, two faucets, a new vent, towel bars, and light fixture, for instance—all those details can easily add up to as much as the cost of an entire bathroom suite. 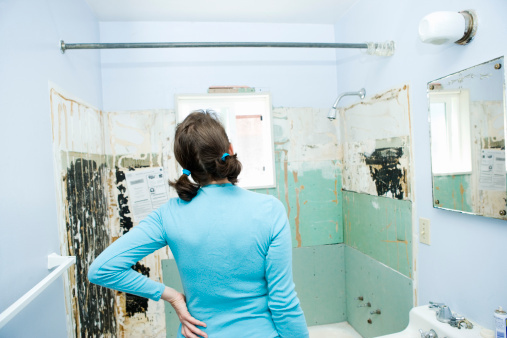 Write down every detail you think you’ll want to change after you’ve decided on the extent of your bathroom remodel (see Tip #1 above), and start pulling together a budget that allows some wiggle room for plumbing mishaps and unexpected electrician visits. Bonus! Bathroom Remodeling Tip #4: 2014 Only Has Twelve Months. Start Now! Bathroom updates and kitchen remodels generally have hiccups along the way, sometimes big ones. Expect them and plan for your bathroom remodel to take much longer than you envisioned. If you’d like your bathroom to be completed in 2014, start making your calls now: interior designer, architect, custom cabinet maker, whomever you need to get the project ideas nailed down. Put your bathroom design ideas into an inspiration document or folder, and get your spreadsheet of needs together now, then be overjoyed if your new bathroom is ready this summer, instead of next December.